Pilates Northwest seeing Pilates Instructor for afternoon/evenings hours and possibly Saturdays. Qualified instructor comfortable with special populations and has kind, positive energy and a developed skill set. 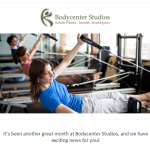 If you are interested, please email Louise Beckley at louise@pilatesnorthwest.com Lake City area location.